These Danner Men's 29110 Black Fort Lewis USA-Made Military Boots are another one of our favorites. Seventy years of stitchdown construction has made these black boots kind of a standard that other work footwear is compared to. 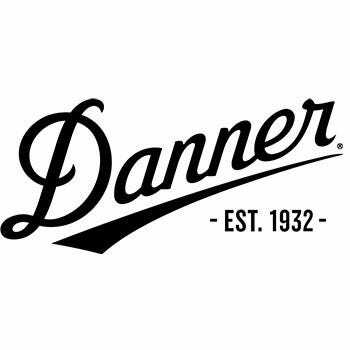 Since 1932, Danner has been practicin ... (see full details) (see specifications) #DNN29110. These Danner Men's 29110 Black Fort Lewis USA-Made Military Boots are another one of our favorites. Seventy years of stitchdown construction has made these black boots kind of a standard that other work footwear is compared to. Since 1932, Danner has been practicing the art of boot-making, and they've never deviated from the professional methods they know work. These Fort Lewis shoes are designed for warmer climates. The full-grainleather uppers on these black boots can be easily polished, which is preferred by those in uniform and on special tactical teams due to its durability and ability to be cleaned quickly and efficiently. This footwear is lined with Gore-Tex, a moisture-wicking and abrasion-resistant lining that'll keep your feet dry and comfortable all day long. This Gore-Tex lining is 100% waterproof, and it'll keep moisture out of the black boots, leaving your feet dry and comfortable all day. This military footwear has fiberglass shanks, airthotic footbeds, and stitchdown soles. The uppers are actually stitched to the soles with heavy thread, resulting in an extremely secure, durable attachment. The benefit to you? Because the uppers flare out and are then stitched securely to the insole boards, your feet rest on wider, and thus more stable, platform. The uppers and insole units of the American-made shoes are then cemented to the outsoles, enabling these slip-resistant boots to be easily re-soled. This footwear also features Vibram 148 Kletterlift oil- and slip-resistant outsoles. The center star lug pattern delivers a great combination of traction and stability. These Danner Men's 29110 Fort Lewis Black Waterproof Military Boots are made in the USA, are also made the old fashioned way because they're committed to the absolute highest quality materials, workmanship, and construction. And Danner has proved it with this men's footwear big time. They'll feel great right out of the box. With the Working Person's Store guarantee, you can't lose by putting a pair in your cart. I just retired from the military and I have not found any boot built better. Get a pair now and you will wear them for several years and love them. They feel good on your feet and the Gortex keep your feet dry even if you get into a stream or something. You will not find them to hot even in warmer weather. I do highly recommend them. WOW AWSOME boots, First time I buy a pair of Danner Fort Lewis boots but not the last. I am a police officer in Canada and work 12 hr days. These boots are so comfortable right out of the box. We had a wet snow storm last week and my feet stayed warm and dry all day. A few years ago I broke my ankle and had emergency surgery on it so I need the ankle support that these boots offer. I bought my "Go Devils" in 1990. I just sent them to Danner to be re-conditioned. They replaced the dortex and the insulation for $150. They are all most as good as new! Bought mine in 1988 in F.R.G.. Hands down the most durable boot ever. Sad day when they were stolen in 1996. If you think about about buying them just go ahead and spend the money. Danner Boots: Men's Black 29110 Waterproof USA-Made Military Fort Lewis Work Boots is being added to your cart.